The 3D Internet company, ExitReality, announced that it is set to expand its virtual worlds offerings by acquiring the popular social network Koinup, well-known for its cross-world promotion of jaw dropping 3D user created art and machinima. 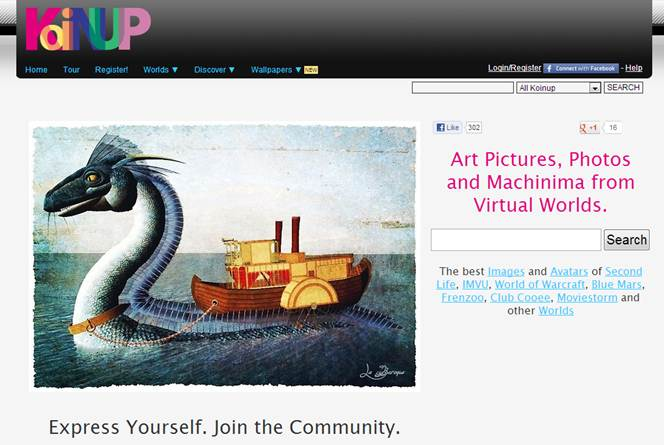 The Italian based company Koinup is an image and video hosting site, web portal and online community for virtual worlds users. It is a free service used both as a photo and video repository platform and as tool to share virtual worlds screenshots, photographs and machinima. Members can upload up to 1.5 gigabyte of photos and videos. Users have a preference for their primary or ‘home’ virtual world but are also willing to explore alternate worlds. It is common for members to have avatars across multiple virtual worlds including Second Life, IMVU, World of Warcraft, Twinity and vSide. Through the social network members can discover others with similar interests and visit these virtual worlds to explore and chat in 3D. Koinup was founded by Pierluigi Casolari and Edoardo Turelli in July 2006 as a creative haven for virtual worlds enthusiasts and a bridge between communities from different virtual worlds. Koinup reached profitability in 2010 through a combination of advertising and affiliation revenue. “It has been six years of nurturing Koinup to where it is today. We are excited to be acquired but also to know that what we created is highly respected and valued.” said Koinup’s co-founder Edoardo Turelli. “We care deeply about our members and even though we had other exit opportunities on the table we chose ExitReality because we are confident they will continue to operate the social network with the vision we created.” added Pierluigi Casolari CEO of Koinup. The strategic acquisition for an undisclosed amount adds to a series of businesses in ExitReality’s web 3D portfolio.